Willie Mays remains one of baseball's most beloved legends. Not surprisingly, Willie Mays cards continue to see strong interest, even among collectors who may not have had a chance to see him play. From early vintage cards to high-end modern hits, Mays is one of the hobby's top-tier stars that can anchor a release. Shop for Professionally Graded Willie Mays cards on eBay. When it comes all-around players, one could make a strong case for Mays as being the best. He could hit for power, average, drive in runs and make spectacular plays. A first-ballot Hall of Famer, Mays finished his career with 660 home runs, placing him in the top five of all-time. 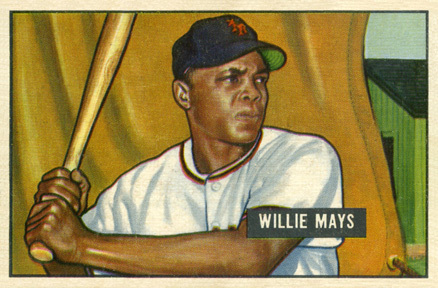 Willie Mays cards continue to command a premium, even among the most elite retired superstars. Out of the game for many decades, Mays is still a regular in new sets. 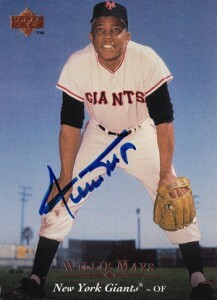 In particular, Willie Mays autographs are often a focal point in Topps releases. Here's a list of ten classic Willie Mays cards. Although value comes into play, that's not the sole criteria. These cards have greater significance beyond merely the prices they fetch. For those looking to build a Mays collection, any of these could be collection cornerstones. For a more expansive look at the vintage options, view our comprehensive Willie Mays card timeline. Click on the listings or images to shop for cards on eBay. Linked sets in the descriptions go directly to product profiles. 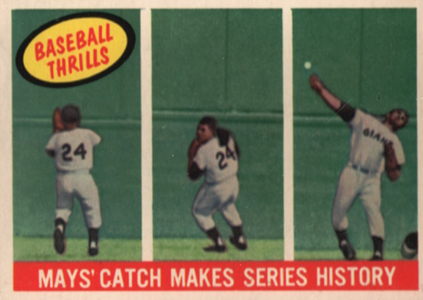 It's not one the most valuable Willie Mays cards, but the 1959 Topps "Baseball Thrills" card captures one of the most memorable plays in the game's history. It uses a storyboard-esque trio of panels to recreate the play known simply as "The Catch." The fantastic over-the-shoulder grab came late in Game 1 of the 1954 World Series, preserving a tie game that Mays' Giants went on to win. The 1995 Upper Deck Willie Mays Autograph isn't the most valuable signature card of the Hall of Famer, but it is the first that was available in packs (sort of). Part of a redemption program in 1995 Upper Deck Series 2 packs, the card is actually quite a bargain. The design resembles the 1995 Upper Deck base set. Cards come with a security hologram on the back. 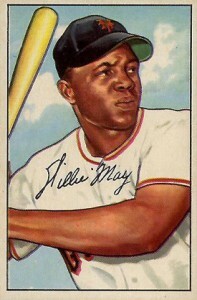 Mays has also signed for many other sets over the years. 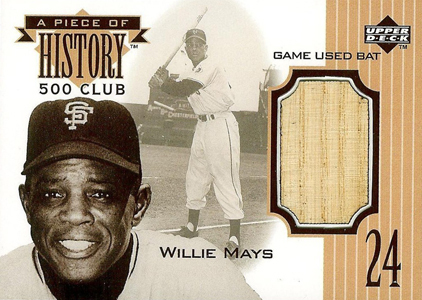 Upper Deck's multi-year, multi-brand A Piece of History 500 Club set is one of the greatest and most loved insert sets of all-time. Even at a time when game-used cards aren't as big a thrill as they once were, 500 Club cards continue to see high prices whenever they're offered. The Mays card was found in 1999 SPx. An estimated 350 copies of the card exist. Another 24 also come with an autograph. Overlooked by many amidst the popularity of 1952 Topps Baseball, the 1952 Berk Ross Willie Mays should be considered something of a bargain for those looking for early cards of the outfielder. Measuring 2" by 3", the card features a tinted photograph and a very bland design. This is no doubt a factor when it comes to the relatively low price when compared to the more much more expensive Topps and Bowman cards released the same year. There is no shortage of adjectives one could use to describe the beauty of 1955 Topps Baseball. Other than the switch from a vertical to a horizontal format, there aren't a lot of differences from the previous year's release. This is doubly-true with Mays as it uses the same portrait shot. Nevertheless, it's an elegant look that still resonates with collectors today. Doing a double-take? 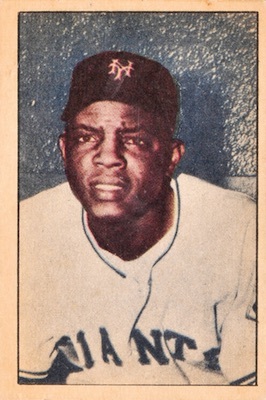 That's the same portrait found on the 1955 Topps Willie Mays. 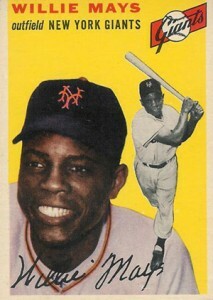 And 1956 Topps Willie Mays. Despite the familiar look, it's still an early Mays card. Like a lot of Topps sets from the era, the 1954 Topps design has achieved iconic status among collectors making it instantly recognizable. A second-year card from one of baseball's best. And it's gorgeous — in a manly, baseball-card matter of speaking. The youthful face, classic stance and blue sky drip in nostalgia. Understandably not as popular as the next card on the list, many will agree the 1952 Bowman Willie Mays is the better looking of the two. Another uncharacteristically serious shot, the 1953 Topps Willie Mays benefits from being part of the late-season high numbers. Even then, the legend is a short print among the already less abundant series. The combination of the short supply and the fact that it's a very early Willie Mays card ensure its legacy in the hobby. 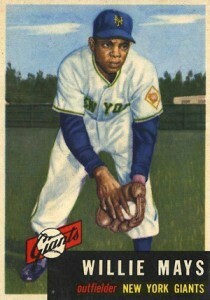 Aesthetically, the 1952 Topps Willie Mays isn't his nicest card. But this second-year card does come from a true landmark release. As a result, it's easy to look past the fact that the all-time legend isn't looking as happy as he normally is (at least on cardboard). 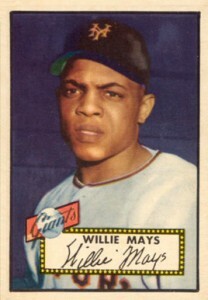 The lone Willie Mays rookie card, it is also one of the most attractive. While it may seem strange to see the edge of the background drape, it adds a little quirk to and otherwise excellent likeness. 1951 Bowman Baseball is one of the best sets ever produced, not only for its checklist, but its beauty as well. 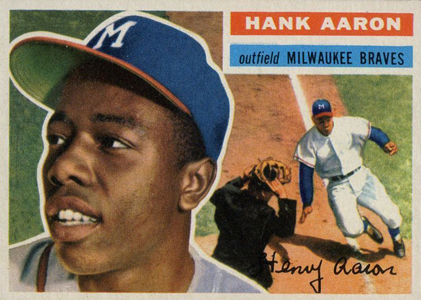 A 1956 Topps Hank Aaron card on a list of the best Willie Mays cards? Yup. Look at the gentleman in the white jersey in the background —the face, not the jersey. Say, hey, that's Willie Mays! So while this isn't technically a Willie Mays card, it actually sort of is. And even if we're stretching it a little, it's still an excuse to admire one of the most attractive baseball cards ever produced. I hv som old baseball cards a Willie mays the card board kind. I have a reprint Topps Willie Mays #261 1990 limited edition card number with B0381 written in ink. I cannot find this card ANYWHERE. It has the Willie Mays autograph panel that is not his real autograph. Can anyone help me with locating this card, value, etc.? It is definitely not on Beckett card submission list. I want to know if it is worth getting graded. 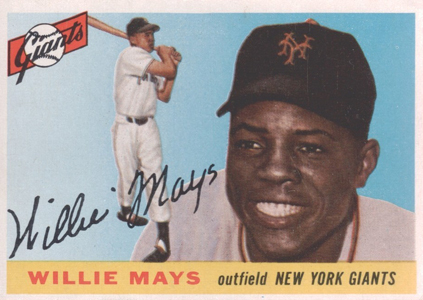 Even though it is not his true rookie, the 1952 Topps Mays is my all-time favorite.